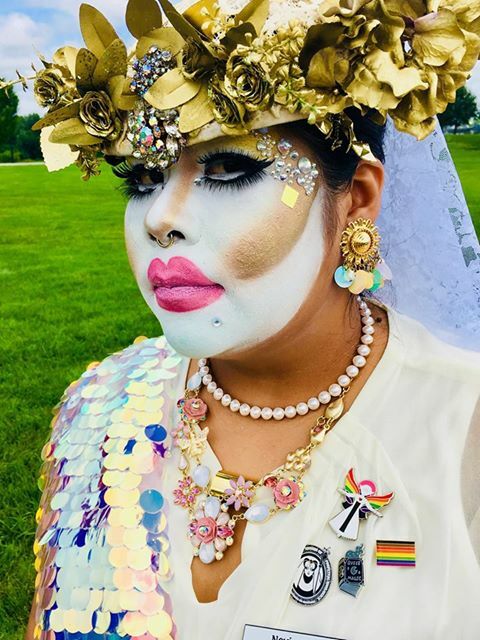 Hunny was born and raised in San Jose, California where she first saw the Sisters of Perpetual Indulgence in San Francisco in 2007. When she saw the gorgeous people in fantastic costumes doing good work and spreading Joy across the city, she knew what she wanted to do with her life: be loud, be proud, and be herself. After moving to Kansas City, Missouri in 2011, she thought she would never see the Sisters ever again. A meeting of fate occurred, however, during the Trump Inaugural protest when she met the City of Fountain Sisters and knew this was her chance. She became a Postulant Sister in May of 2017 and a Novice Sister in December 2017. Most of her work surrounds in LGBTQAI+ youth, Suicide Prevention, transgender rights, LGBTQAI+ people of color issues, and LGBTQAI+ health awareness.